Hi everybody! Mrs. was recently contacted about trying a new product out & boy am I glad that she was!!! We were sent a bottle of French Moroccan Oil from Viva La Dog Spa. Usually if I see Mrs. coming towards me with a bottle, I try to get away as quickly as I can, because due to my sensitive allergy suffering skin, I usually am getting sprayed with ouchie stuff to keep me from getting infections! This time though Mrs seemed pretty relaxed & I thought that I would stick around to see how things played out. As is usually the case, I was stretched out taking up most of the bed when Mrs. sat down beside me. When she opened the bottle, I could already tell that I was going to like whatever it was! She took just a couple of drops (has convenient dropper lid) & rubbed it between her hands & then she gave me a massage! All the way from the tips of my ears to the bottoms of my feet. All I can say is WOWSER!! This stuff is AWESOME!!! My skin feels soft & supple.Here I am after my massage. Do I look relaxed or what?! And now a few words from Mrs. I was a little skeptical of the oil at first, because I thought that it would leave a greasy feeling & I was also worried that it might leave stains wherever the dogs plopped down, but that is not the case! The oil was absorbed into the skin & left the dogs feeling great! We just so happened to be fostering a Standard Poodle (1 of the breeds it is recommended for) while we were trying the oil out & I used it on her. This left her hair feeling very silky & she too enjoyed the attention.The products are made in a solar powered plant, the company pre-cycles & all of their bottles are recyclable! You can read more about it here. Bottom line is we feel that Viva La Dog Spa's French Moroccan Oil is a great product that will not only make your pooches fur & skin feel wonderful, but also feels great on people too! The pooches give it a two out of two smiles! Oooh, I may have to give that a try! Emmett and Cooper both have dry, irritated skin and a whole host of allergies that cause other problems. That sounds like it might be a great solution!! I've tried it out for myself when I was at my sister's house (and I always meant to pick up some of my own), though I never realized that they had it for pups too! And I bet it smells so good. I like the two out of two smiles. That's would be - what? - FOUR paws up? I am interested to know if either of them show any itchyness from it in a day or two - I have to be very careful what products I use on Eddie as his skin is so sensitive he itches itches itches with even some hypoallergenic products. Your new foster is so good-looking. 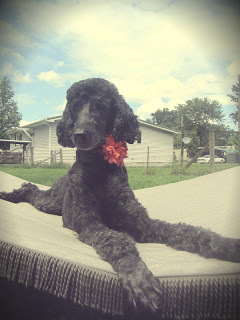 Before I joined the Greyhound cult, I thought if I ever got a dog, it would be a Standard Poodle. This oil sounds wonderful. I'm going to check it out. A massage? You lucky dogs! You definitely do look relaxed! Sounds like the oil worked very well too. The hounds love a massage - and what a great product with which to soothe their skin in this heat. Will check it out, Beach Baby Pauley James :).